Villa Maria Damigou, located in Firostefani, at 10 minutes walk from Fira, has rooms and suites with free WiFi. 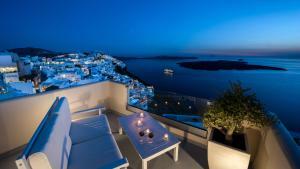 Breakfast is served on the furnished balcony overlooking the Santorini volcano and the Aegean Sea. There is a balcony with views of the Aegean Sea and the volcano, a kitchenette with a fridge, and a private bathroom with a hairdryer. Children are not allowed in this type of accommodation. This room features a private balcony with partial views of the Aegean Sea, a refrigerator and a private bathroom with a hairdryer. This room has a refrigerator and a private bathroom with a hairdryer. It does not offer views. This double room has air conditioning, tile / marble floor and balcony. Suite with Caldera views, balcony, spa bath and sofa.